Corporate structure is changing. With the influx of millennials into the workforce, corporations are shifting from a vertical and hierarchical culture to a more horizontal and cooperative approach. To encourage collaboration and inclusion, companies have shifted to using open-concept office spaces. Instead of being confined to a cubicle, open floor plans create higher visibility of each staff member encouraging interaction and accountability. One of the major pros to open office designs is the cost efficiency. By eliminating the bulky and space-consuming cubicles, companies can get in more workstations per square foot. Also, long tables lined with monitors and chairs is far less expensive than filling that same space with personal cubicles. 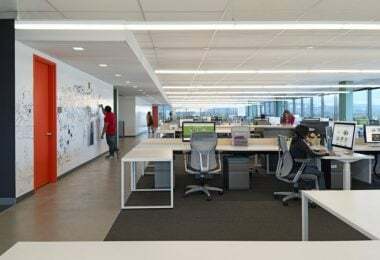 And if we’re being honest, open office design looks more appealing, which is a key recruiting tool for young professionals. They have a larger aesthetic impact than the traditional office space making your office space brighter and homier. However, the drawbacks of open-concept spaces are glaringly obvious. Without any barriers, employees easily get annoyed or distracted by the habits of others. Thus, putting a strain on employee interpersonal relationships. Promoting togetherness and unity within your team is a great morale booster. However, when employees are arm’s length from each other throughout the entire work day the “closeness” can be a little too much to bear. Open-concept spaces leave little room for privacy and create a fish-bowl effect. The result, employees feel as if they are constantly being observed and evaluated. Often overlooked, there is a third happy medium to the traditional and open-concept floor plans: “Flex” office design. Flex office design plan rests on the principle that you shouldn’t have to conform to your office space when you can make your office space conform to your needs. By using portable room dividers your office layout is adjusted is minutes. Let’s say your team is having your monthly meeting and need a collaborative space with privacy from the rest of the office. Simply roll your partition or divider into any position to create a closed off meeting room while the rest of the office continues to work in the open layout. When you’re done, roll the partitions to their storage space and the room is easily restored to its open design. 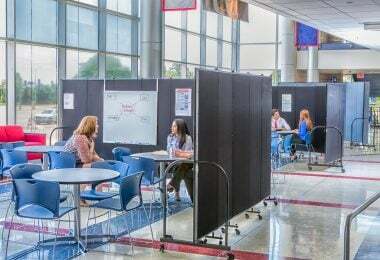 During a “busy season” when everyone is looking for privacy, partitions are positioned to create a traditional cubicle feel, absorb sound and eliminate distractions. “Flex” office spaces are the perfect balance between privacy and connectivity, allowing your office to serve your employees’ needs while encouraging a cooperative and dynamic culture.